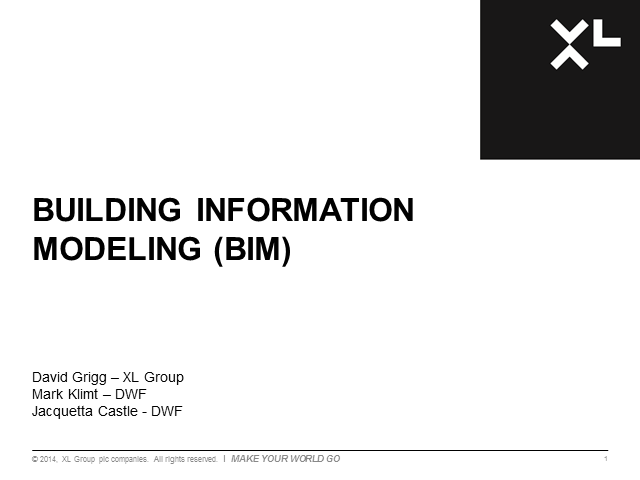 Do you know the Risks & Rewards of Building Information Modeling (BIM)? BIM technology has grown in importance as the economic environment and global competition mean limited financial and human resources and tight time schedules. The benefits are significant; efficient management of resources, materials tracking, less waste, smooth transition from design team to contractors and subsequently owners... it sounds like a perfect scenario. However, there is a danger of becoming overly reliant on BIM. Using real life examples, this webinar is designed to help you take advantage of this technology while helping you avoid or mitigate the risks. Tune in live to hear our experts presenting a range of perspectives. David Grigg of XL Group, will discuss liability implications and the importance of the four primary non-technical risk drivers on any BIM project. He’ll also explain the case for project shaping. Mark Klimt of DWF will explain the different BIM levels and outline the regulations and timetable for the compulsory use of BIM for centrally procured public sector projects. Mark will also talk about the operation of the Standard Protocol for use in BIM projects and the new roles created by the Protocol. Jacquetta Castle of DWF will outline cyber and security risk issues and will be looking at various insurance solutions together with the issues arising out of the global nature of cyber risks. Cyber Business Interruption (BI) is a relatively new coverage to the market but one which is expected to become increasingly relevant to your clients. Our aim is to equip you with the relevant claims knowledge to support your client if they experience a cyber business interruption loss. This 1-hour webinar is focused on the analysis of cyber business interruption. We’ll use worked examples to walk you through the claims process, from policy triggers to investigation considerations. ​​Is your law firm at risk? What impact could a potential claim have on your business? What steps can you put in place to safeguard yourself? This 1-hour webinar is focused on Risk Management procedures for law firms. Using real case illustrations, it will address how you can improve your risk management to help mitigate risks and prevent claims. Our panel of expert speakers will also address the role of insurance in risk management, in light of emerging risks faced by law firms. With the back drop of rising energy costs, cash-strapped organisations across all industries have one unanimous goal: saving money on their energy bills. Through effective energy management, you can significantly reduce your energy consumption, meet government targets and ensure bottom-line savings. In this live ENDS webinar we take a detailed look at the challenges around energy management and offer inspirational case studies and actionable insights to help you take control of your organisation’s energy consumption. Most organisations, even those perceived as low-risk, such as offices, shops, and schools, have significant potential environmental liabilities. Yet most business leaders do not recognise these, or understand the scale of the impact they can have on their bottom line. Even small pollution incidents can give rise to substantial clean-up costs, third party liabilities and legal expenses, often many times the size of the fines. In reality, most organisations have environmental liabilities. These may take the form of contractual, reputational and operational exposures. Environmental management systems, and effective maintenance in site infrastructure and monitoring cannot always protect an organisation from all environmental risk. Traditional public liability policies can leave huge gaps in coverage and many organisations are left unknowingly but dangerously exposed. So are you actually protected? Register for this live ENDS webinar and find out how you can best protect yourself. deceit? What would you have thought of 6 months ago? This webinar previews the upcoming ENDS CSR Data Management and Application Conference, tune in to hear expert speakers from the conference sketch out how CR is core to their organisation’s business plan, and how to best monitor and communicate their CR activities. * How to effectively identify, collect, collate, and format the data relevant for your CSR programme - including supply chain data. * Methods for improving data consistency, accuracy and quality by following best practices, and examining the benefits of assurance. * Strategies for identifying stakeholder needs, ensuring transparency, and identifying the best channels to engage with your customers. Certain elements of CSR have slipped down marketing and sustainability agendas but leading brands such as Truvia and Walkers Crisps are successfully using environmental labels to build brand trust and bolster their bottom line. But with so many labels now available on the market, what could they do for your consumers and your business? • Do consumers actually recognise the logos and how do labels influence purchasing decisions? • What does the latest Carbon Trust research say about how consumers engage and respond to environmental claims? • What are the financial and time implications of implementing environmental labels? • What is the bottom line value of using environmental labels and does this outweigh the risks? • How can you use environmental labels to gain a competitive edge and drive sustainable long term value? -Measurement and Verification best practice – what’s working and how can you prove it? Whilst there is growing awareness of Demand Response activities in the energy sector, there is still uncertainty regarding the rewards and the potential risks associated with this programme. In our next live ENDS webinar we will be revealing the facts behind Demand Response and the role it can play in enabling energy efficiency and carbon reduction. -What is Demand Response all about, who’s involved and can it help you to meet energy and climate change requirements? -What are the risks of doing demand response activities and how can you tackle them? -What are the financial rewards and do these outweigh the risks? -What does the future hold? How can new technologies and policies help the energy sector move towards a more sustainable and smarter grid? The Earth's resources are going down, their costs are going up; but why should businesses bother? Given the Earth's dwindling finite resources companies are facing more financial, environmental and reputational pressures than ever. But with the dust of the recession barely settled and boardrooms awash with pressing issues, just how important is sustainability to core business and how much weight can the sustainability champion bring to bear on their company's reputation, stakeholder confidence and ultimately bottom line? - Setting the scene; what is the future outlook for resource cost and availability and what does this mean for corporations? The ENDS portfolio have launched their webcast offering to feature the leading authorities in the environmental and carbon industries covering you key challenges. Sign up to this channel for hard-hitting insights into the hottest environmental issues.You can also take part in our votes, put you questions to our live experts and offer us your feedback.